As shark populations around the world decline, conservationist are concerned that Asian chefs may look for Manta and Devil Rays as replacement for the popular shark fin soup. Since rays swim slowly and near the surface, they make for easy targets to the fishermen that hunt them using harpoons. At this point, the number of rays being fished is relatively low, but this could shortly change. 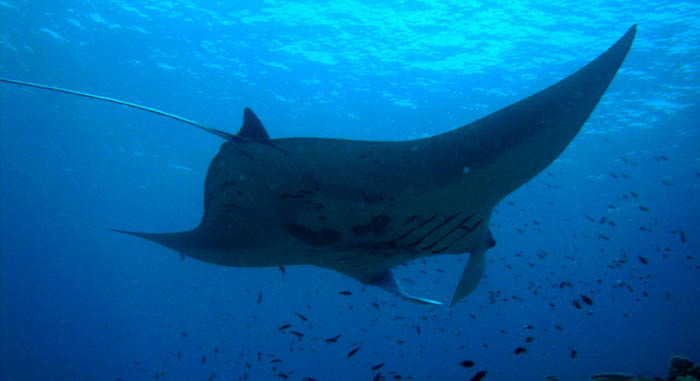 Marine biologist Tim Clark of the University of Hawaii says “Mantas and mobulas are being used as shark fin soup filler” in cheap versions of the popular soup. Ray are believed to live for over 50 years, and only reach maturity in their teens. Even at that, they only produce 1 pup every 1 to three years. Coupled with how easy they are to hunt, ray are a perfect target for overfishing. In addition to becoming a shark replacement, ray gills are being used in Traditional Chinese Medicine (TCM) to reduce toxins and purify the blood. As the market for shark fin soups is consistently growing, the shark population is declining; reportedly by 80% over the past 15 years. I truely hope this is not true… I have been swimming with these majestic animals and it would be a tragedy if they were used for soup! So tired of ignorant people eating everything that they can get their hands on. Naturally has to be over populated groups on top of that… The ocean cannot be measured as to how serious it is to man surviving on land without it in balance.